Darren Ferguson spoke of his admiration for Neal Ardley's AFC Wimbledon side, ahead of their visit to the Keepmoat this Tuesday evening. "I like them [AFC Wimbledon], I think they're a good team. They're full of energy and they played very well on Saturday in the first-half against Wigan. "They've been playing with two strikers which we don't face all the time. They have good experience and they still need something to make sure they're safe. It will be a tough game." There are no new fresh injury concerns for the Rovers manager with him debating about captain James Coppinger's involvement on Tuesday night. It's believed the Scotsman wants Coppinger to complete near to 90-minutes against Wigan on the final day of the season. So far this season the Keepmoat has witnessed a Rovers goal on an average every 44 minutes, whereas they've seen the away side scored every 48 minutes. 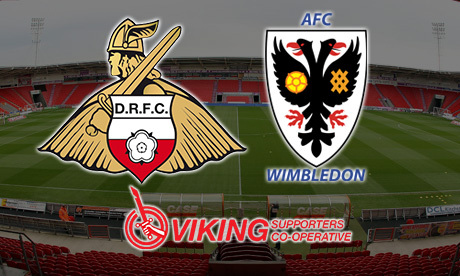 Lyle Taylor is the Dons' top goalscorer this term with him netting 17 goals while making 6 assists. He's managed to convert 50% of his shots on target this season and will surely be a real handful for the Rovers back-line. In the previous encounter, Rovers succumbed to a dismal 2-0 defeat which was dubbed this sides 'poorest' performance of the season, alongside Walsall away.